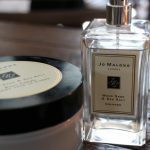 I got to first give this new Jo Malone scent a whiff back in May, and of course I had all the well intentioned plans to post about it on launch… which was the start of this month. But of course the old ‘best laid plans’ and all that… and I’m a tad late. 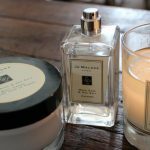 But with this one, better late than never – as Jo Malone Wood Sage & Sea Salt is an absolute dream of a fragrance. Seriously, you need to try it. Basically, this fragrance manages to somehow magically capture the essence of a cool British seaside breeze – the sort that chills your cheeks and wakes you up in a way no other sensation can. 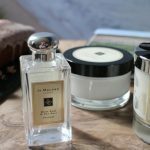 The imagery and campaign around the new scent is equally dreamy – with a gorgeous English rose girl wearing a pretty tea dress, topped with a cosy cardigan roaming the coastline and sand dunes of an epic deserted British beach. It makes me want to sack in London life and relocate to Pembrokeshire or somewhere equally as breathtaking. Scent wise, it’s a very hard one to put your finger on as the notes really are some sort of wonderful concoction that just works like magic to smell dreamy. Sea Salt & Sage are the key ones – obviously, but with something musky but still fresh in there. 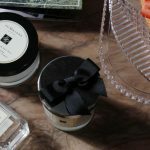 All I can really say is, next time you wander past a Jo Malone London counter – stop off and take a moment to smell this. If it doesn’t take you whisked back to a brisk seaside walk then I’ll be surprised. Thank you! It’s seriously lovely – well worth it! I had a tester of this in a magazine and it is absolutely gorgeous, I don’t think i’d personally wear it but I would adore the candle!